Content is king, but what does that mean for you? How will it keep your business moving forward when content writing requires so much time? How will that bring leads in? You’re want to write the best content because you want your customers to find you first, find you fast, and find what they need. Creating valuable content that finds its way to your audience requires you to stay true to your purpose, the customer. Of course, efficiency makes it happen week after week — drawing in consumer and search engine traffic through frequency and follow through. But successful web content come from the value within it. Use these seven tips to get your content done right and get ready to see the leads roll in. An editorial calendar lays out content topics ahead of schedule. This tool saves valuable time and defeats creator’s block. Knowing your purpose for each piece of content and how it fits into your goals keeps you on track. Try grouping similar topics together for content that fills the calendar and helps writing flow. When your all of your content is connected to each other, it has a better chance of connecting with your readers. Understanding your customers enables you to create content they want. Initiate conversations via social media. Conduct surveys, and listen to customer conversations, questions and pain points. Use these common themes to fuel content creation. Doing so births relevant content plus, your action makes your customers feel heard. Consumers are smart. They sniff out the companies who are listening and taking action just as well as they sniff out cookie-cutter BS that makes them run the other way. Who do you think they’ll approach to fix their problem? Images, infographics and videos draw the eye of consumers. And, search engines love them as well (as long as they can read the text). Plus, videos (the top form of content for 2018) and their visual comrades save time compared to written pieces. Grab your phone and start recording, enlist loyal customers to participate and remember to tell a story — consumers love them. You can create blog articles out of this content. This will enable you to repeat the content within your video or infographic in plain text that is crawlable. Additionally, you can share your blogs on social media, directing traffic not only to the video, but also to your website and your forms. Beyond the visual, creative content comes in various formats. Facebook posts, Tweets and Instagram photos connect customers with your content where they hang out. Podcasts allow them to listen on the go. Guides, ebooks and blog posts build authority. Try Listicles, it'll give readers quick shots of skimmable material. Having content throughout multiple platforms helps saturate your web presence. The goal is to spread your content to all of the spaces that your customers are living in. Find out what kind of materials your customer wants to see and give it to them in multiple platforms. Content becomes a mix of the ideas and thoughts copy creators (and copywriters) experience every day. Broaden the content experience you have and not only will you have more to work with, you’ll have better quality. Look to forums, your personal reading list, blog posts, the work of industry leaders and your competitors for strategies, topics and concepts that work. Remember, the point is inspiration, not plagiarism. Take the inspiration and apply your company perspective to the topic. Creating content on varied topics tends to get overwhelming. Instead, dive deep into subject matter. This strategy builds expertise and trustworthiness for customers and search engines. Break long-form content, such as email marketing guides, into separate posts. Or, combine blogs on automated email, targeted emails and the like into an ebook. When your customers are searching for solutions to their problems, they are typically very specific to their pain. Even more than that, the readers you want flocking to your material are the ones who resonate with it the most – these people make the best customers. The more specific your content is, the more targeted your incoming traffic will end up being. Efficiency keeps content creation manageable. Using a formula for each format allows you to post content quickly and at an expected frequency (for recurring content). For instance, outline all videos for the month the same — a title, description, recording, supporting media, transcript and call-to-action. Furthermore, create several pieces in one time-block. Write blogs for the week in an afternoon. Or, record ten videos in a day. This will connect your content together, create a consistent voice for your content, and it will keep you on top of your publishing. The content is only strong if you are diligent with strategy and approach. These seven tips keeps content saturated and flowing while providing value to customers – that’s what brings in the leads. 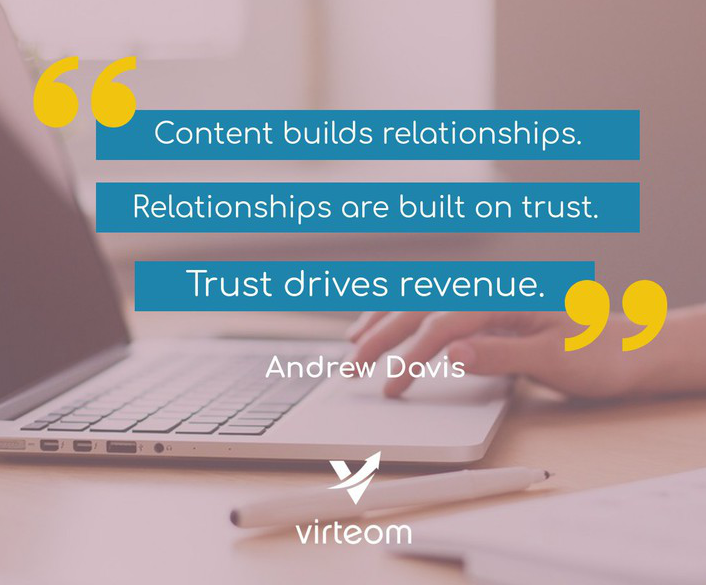 Contact Virteom today to discover the software and tools that deliver this content to your customers with efficiency and results.